Travel theme: Fantastic | Oh, the Places We See . . .
At almost any point of any given day, Zion National Park offers fantastic views. On the afternoon of our visit, ever-lengthening shadows crept across this imposing juncture, causing minute-by-minute color changes while adding a sparkle to the stream below. For more fantastic photos on Ailsa’s site, Where’s My Backpack for Travel theme: Fantastic, click here. 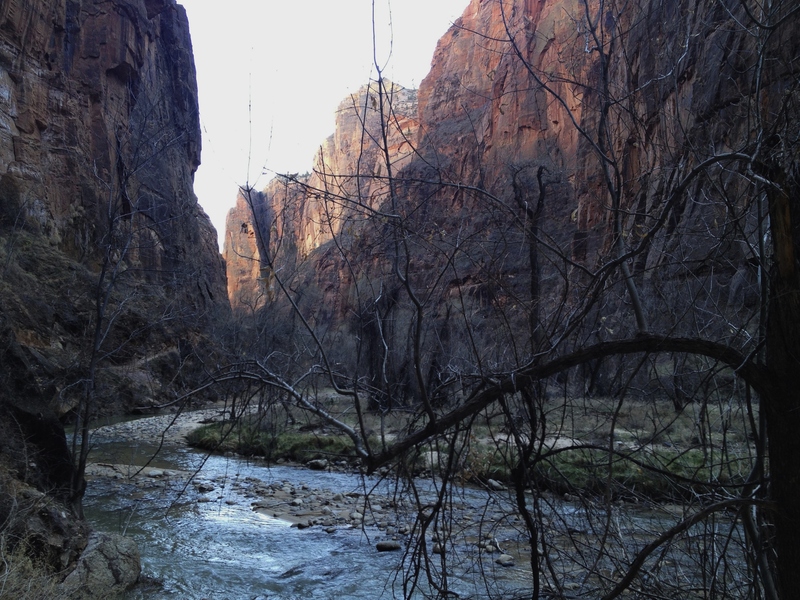 This entry was posted in Travel Theme and tagged mountains, stream, Travel theme: Fantastic, Zion National Park. Bookmark the permalink. What a coincidence, one of my friends showed me pictures of his visit to Zion National Park yesterday. And since then I have been thinking what would be a good time of the year / good time of the day to go visit this place. Any suggestions from your experience? So glad you are interested in seeing Zion National Park. It’s one of our all-time favorites. We went in early spring, so we missed seeing wildflowers and early bloomers. We did, however, see little waterfalls and signs of spring everywhere. The advantage to this early arrival was that the park wasn’t crowded. We stayed in the lodge and even the restaurant was easy to negotiate. We visited for two full days, and I’d recommend you take advantage of morning and afternoon sun if you like to take photos. The shadows are fantastic!!! Just walking through Zion even without a backpack was a journey for us. Loved that place! Who knew that shadows on rocks could be so fascinating!